In 2013, a significant new opportunity to improve Californians’ mobility options emerged in the Active Transportation Program (ATP), which consolidates and streamlines funding for bike, pedestrian, trails and Safe Routes to School programs. Through the hard work of advocates, the Legislature ended up increasing the total allocation to the activities in the ATP by more than a third for the next fiscal year. At the same time, the potential exists for an even bigger funding increase in the next decade, in the form of proceeds from the state’s cap-and-trade auction program. With annual revenue expected to be in the billions, and a large chunk of proceeds slated to benefit disadvantaged communities, California has an opportunity to invest more aggressively and effectively in active transportation. However, the exact amount is far from guaranteed and many potential spending priorities will compete for a slice of the pie. With the governor’s preliminary budget scheduled for release on January 10, the time has come for our elected leaders to step up and invest in more livable streets and communities. California’s landmark 2006 climate change law, AB 32, seeks to reduce the state’s greenhouse gas (GHG) emissions to 1990 levels by 2020, and 80 percent below that by 2050. The law includes a comprehensive portfolio of GHG reduction measures, one of which is cap-and-trade — a cap on overall emissions in certain industrial sectors paired with a system of tradeable emissions allowances under the cap. The state will distribute some of the allowances by selling them at quarterly auctions. A great summary of cap-and-trade can be found here. The program is just wrapping up its first year and applies only to large power plants and industrial operations. Starting in the 2014-15 fiscal year, however, it will apply to distributors of fuel, including fuels used for transportation — a sector that accounts for 38 percent of GHG emissions statewide. 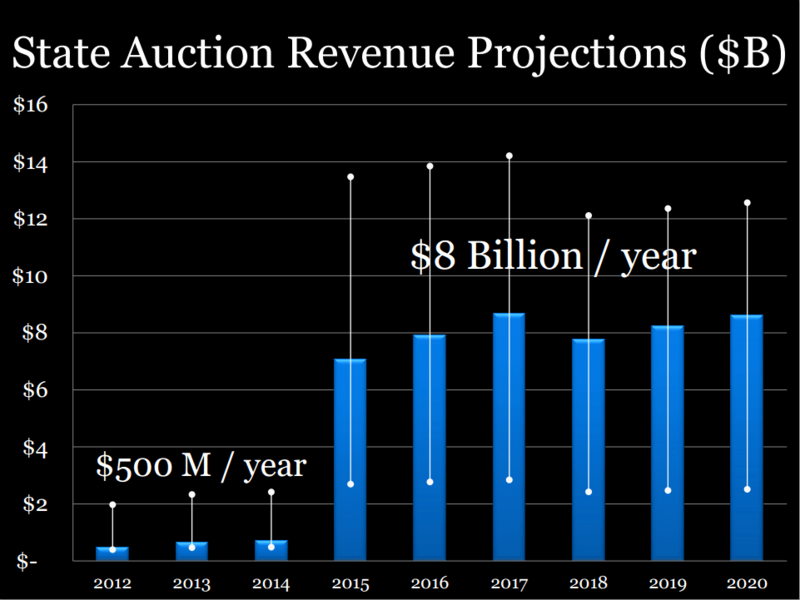 The revenue potential is substantial: a Natural Resources Defense Council analysis, presented at a UCLA conference last February, estimates (pdf link) that total revenues could be as much as $8 billion annually once the program is fully up and running. Because transportation is the leading cause of California’s emissions, there is a strong case for investing auction proceeds in alternatives to cars and fossil fuels. Ryan Wiggins, the cap-and-trade campaign manager for the Bay Area-based advocacy group TransForm, said in an interview that the ATP is very likely to receive at least some AB 32 dollars. Indeed, the investment plan (pdf link) produced by the state Department of Finance (DOF) names active transportation as a sub-category of “Sustainable Communities and Clean Transportation,” which forms the top investment priority for the state. Another important aspect of the cap-and-trade program is its mandate to help low-income neighborhoods suffering from health disparities. Under SB 535, enacted in 2012, one-fourth of the auction proceeds must be spent in way that benefits disadvantaged communities, with 10 percent going to projects located in those communities. The state Environmental Protection Agency (CalEPA) has been using its CalEnviroScreen mapping tool to identify the communities in which the proceeds should be spent. A large proportion of the highest-scoring ZIP codes (pdf link) lie within LA County, mainly within industrial corridors and in inland valleys where topography tends to exacerbate regional air pollution. This brings up an important point: not only does active transportation promote public health by encouraging physical activity; it also provides an opportunity to improve air quality by reducing many of the co-pollutants — particulates, smog-forming emissions, carbon monoxide, etc. — that typically are emitted along with GHGs. Considering that localized air pollution is a big problem (pdf link) near high-traffic roadways, communities along California’s freeways and major arterials could benefit greatly from investments to shift trips away from single-occupant cars and toward transit, walking and bicycling. All this comes as advocates for livable streets and public health are making a big push for bike and pedestrian projects in South LA, Carson, and other lower-income areas of the county (full disclosure: this writer, in a different capacity, wrote the South LA post linked to here and has worked in a supporting role on the Active Streets LA project). They’ve already taken significant steps forward by convincing Metro to direct a portion of ExpressLanes toll revenue to active transportation in communities adjacent to the 10 and 110 freeways, and they could probably accomplish a lot more if given access to new grant sources funded by auction proceeds. How much money goes to the ATP, and when it becomes available, on the other hand, has yet to be decided. DOF’s investment plan isn’t an appropriations bill; the final decisions about funding will be made by the Governor and Legislature, who aren’t obligated to spend the money the way the investment plan says they should. Sacramento is already setting a precedent of using the initial auction proceeds as a slush fund of sorts. For example, the first two fiscal years’ worth of funds — about $500 million — are going into the General Fund as a one-time loan of undetermined duration. And then there’s the matter of high-speed rail (HSR). There’s long been talk of using auction proceeds to supplement existing funding for the statewide bullet train project, and the state’s investment plan also places HSR within its top priority area. Now, under a recent Superior Court ruling, the state has to identify a source for $25 billion in additional funds to complete a self-sufficient initial operating segment before it can access more than $8 billion in state bond proceeds. Cap-and-trade dollars could be used to help to fill that gap. How much will be left for active transportation after HSR gets its fill? No one really knows. The $25 billion the state needs is more than three years’ worth of auction proceeds, and that’s assuming that the estimates cited by NRDC are accurate. It’s still possible that the vast majority of AB 32 dollars for “sustainable communities and clean transportation,” as the investment plan calls it, could be dumped into the bullet train project, with only a token amount going to bike and pedestrian programs. That’s without even considering regional bus and rail transit, which is just as susceptible to getting crowded out. To have HSR stifle potential increases in bike, pedestrian and transit funding would be a missed opportunity, because HSR generally doesn’t serve the neighborhoods and jobs corridors where we do the vast majority of our daily travel. According to a report (pdf link) by Safe Routes to School National Partnership, about half of all trips in Los Angeles County are three miles or less. Shouldn’t we be putting at least as much of our resources into shifting these trips away from driving as we are into providing another option for the occasional LA-to-San Francisco haul, which for most people is a once- or twice-a-year proposition? There are two main efforts to ensure that cap-and-trade money gets invested responsibly in sustainable streets and communities, both of which are worth following and supporting. The first is Wiggins’ campaign at TransForm, which is calling for a comprehensive package of funding for affordable housing, expanded transit, and livable streets. The other comes from the Transportation Coalition for Livable Communities, an alliance of local and regional governments as well as labor and environmental organizations, including NRDC. The two groups will be working to influence cap-and-trade spending through the state’s normal budget process for FY 2014-15, as well as through individual bills that would dedicate a portion of proceeds to sustainable land use and transportation on a permanent basis. It remains to be seen what the precise content of those bills will be. Surely the HSR plan is an important project with the potential to offer many benefits to statewide mobility and to GHG reduction. Our communities, though, are where we make most of our trips. The quality of the options available for these trips will make the biggest difference to how people get around on a daily basis, and will have a more immediate impact on the air pollutants that hurt freeway-adjacent neighborhoods. Livable streets and transit should get more than a token increase in funding. By finally putting a price on carbon, California has already put itself on a solid footing as it seeks to meet its greenhouse gas goals. The auction proceeds, if spent in ways that support clean mobility at the local level, represent an opportunity to drive further progress toward a healthier, more livable, more sustainable future for the state and its communities. Starting January 10, for the good of our region, our state, and our nation, the Legislature and Governor should seize that opportunity. Bio: Niall Huffman is an urban planner and policy analyst who lives in Los Angeles, where he volunteers with the Los Angeles County Bicycle Coalition and advocates for livable streets and communities. He blogs occasionally at kneel28.tumblr.com and can also be found on Twitter @kneel28. The views articulated here are his own and are not expressed on behalf of any company or organization. HSR will have several stations in the LA/OC area, so it will be used as commuter rail south of the San Gabriels. The intent is HSR would be part of an integrated network of transportation alternatives providing mobility without having to be dependent on cars or planes within the state. That is vital to build broad support for active transportation. Sustainability has to not be allowed to be turned into “our set of priorities or else” or it could easily become politically marginal. When you deal at the state level the various moving parts etc. involved are very complicated. Trying to influence that isn’t easy. This piece was not intended as a diatribe against HSR, and I made a point of acknowledging its potential benefits. My main intent here was to argue *in favor of* livable streets and regional transit, and to plead with the Governor and Legislature to seize the opportunity to make transformational investments in these modes. To the extent that HSR enhances the value of those investments and helps tie them into a larger system of alternatives to automobile travel (and as Dana points out below, it could very well do so if built the right way), I support it. Why not start with the in-basin improvements first, then? What’s with the all-in strategy of starting in the center and finishing the entire project or bust? I know the question is rhetorical, but the honest answer is: constraints imposed by Prop 1A and the courts, mainly. If we can have some champions among the electeds that would be very helpful. Do you a sense whether either campaign is doing lobbying days to have activists come to Sacramento and walk the hallways of the state Capitol sharing with staffers etc. why this is important? I have just learned Feb. 1st NARP and RailPAC plan to hold a joint conference in the Metro Board room and among the speakers will be Dan Richard, Chair of the California High Speed Rail Authority, who will talk about Cap and Trade funds and the status of the project. That may give us a sense of whether the approach will be for an integrated network. BTW, Don Sepulveda, Metro’s Executive Officer–Regional Rail, has stressed HSR in our region will initially link up with the air transport network at Bob Hope Airport — that will become a de facto regional hub. TCLC doesn’t have a lot of current information online, though individual partners in the coalition may sponsor their own lobbying days. Because then it will just become glorified commuter rail for the Bay Area and LA and the will to build the middle and connect the whole state will dissipate. The real heavy lift is getting passenger rail through the Tehachapi Pass. Once the backbone gets built, then connecting it to the big metros on each end becomes an inevitability. Another very good reason: the first chunk is being funded by stimulus funds, which had to be spent by a date certain. NIMBY battles over turning existing commuter lines in the Bay and LA into HSR-ready corridors will drag on for years. TransForm had aspirations of being a statewide group not just Bay Area centered. I don’t believe thus far they have been overly successful in expanding their footprint. They have an office in Sacramento and obviously experience working the process. Plus it is a lot easier to get stakeholders etc. to show up for a lobbying day from the Bay Area versus from down here, so they can more easily have a good turnout and boots on the ground matter when trying to influence the legislature and administration. In this era of term limits it is hard to make progress when the key players in the legislature turn over every few years. It means you have to re-start educating them about livable streets and regional transit as being worth the time and effort to aid in making the state economically competitive. Maybe another potential source of revenues would be the proposal to raise vehicle registration fees to fund the repair of roads and bridges? Has anyone suggested to the proponents that a transit/livability aspect may make it more likely to pass? I should add that while I understand all of the constraints and political calculations re: HSR, it doesn’t make HSR a superior use of cap-and-trade dollars, and doesn’t justify crowding out more substantial investment in things like active transportation and regional transit beyond the HSR alignment. We don’t absolutely, positively need to wait decades for HSR to arrive in the urbanized parts of SoCal and the Bay Area to create viable, high-quality alternatives to driving for daily transportation (which from the perspective of GHG reduction is the type of travel that holds the most potential). We *do* absolutely, positively need, however, to improve the transit/walking/biking connections between existing neighborhoods and destinations in our communities if we expect anyone to change how they get around — and we can do so in the span of about a decade if we’re willing to devote enough resources to it. Small investments that can produce results near term versus big ticket projects that take forever but are sexier and thus able to grab attention/funding is not a new dynamic in the policy sphere. One challenge is perceptions. Some seem to feel anything other than laying pavement is a waste of transportation funds. Plus while going for a mother lode by lobbying Sacramento may seem like a good strategy to have a wide-ranging win maybe being focused locally and incrementally may be a better strategy. On the 25th in Rancho Cucamonga the Pacific Electric Etiwanda train depot will celebrate its centennial. The event is being held by the local group that turned an old PE right-of-way into a bike and walking trail. Showing politicians these sorts of success stories from places you might not expect could help undercut divides like urban vs. rural that often hobble advocacy efforts at the state level. Actually, last year TransForm turned out 130 people from all over the state for the advocacy day and a very large proportion of them were from Southern CA. We were able to provide a large number of travel and lodging scholarships with the support of foundations and our SoCal partners. Additionally, TransForm intends to strengthen its relationships with partners in SoCal rather than supplant them. The connecting funds set aside for HSR should help. We need to beef up Caltrain, Metrolink, ACE, and Amtrak. However, we need a source of operating funds for local transit. Besides avoiding congestion, I think there is little environmental benefit to taking a train across the state only to rent a car at the end. If some of the cap and trade funds got funneled into State Transit Assistance, we would see immediate benefits. I am all for more operating funds, but that likely would also hit roadblocks in Sacramento. Has anyone done outreach to the California Transit Association, the trade group who have a strong lobbying component? Great! We need something to provide a statewide voice as it is clear Odyssey which did that but wilted up about a decade ago seemingly isn’t coming back. Roaming those hallways in Sacramento is tedious but can produce results. We need to be aware and engaged. I’ll keep an eye on my e-mail as I receive alerts from TransForm now and then. In the first step of the budget process for 2017-2018, Governor Brown proposed a budget that shows fiscal restraint--and includes money for the Active Transportation Program. With a one-time boost of $10 million from cap-and-trade, the ATP will be able to fund more projects. CTC staff recommends a bike and pedestrian pathway in South Lake Tahoe, an expansion of L.A. Metro bike-share near USC and the Expo line, and bike-share in the San Gabriel Valley.